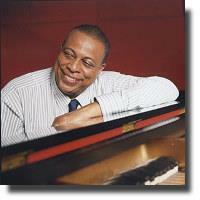 The first words that came to my mind when Chucho Valdes walked out on stage for the first time were "Quiet", "Humble" and "Gentlemanly". Bowing reverently to the thunderous applause and gleeful hollers that welcomed him to the spotlight, the virtuoso musician set to work immediately with a light hearted solo number. As his hands flew up and down the keyboard effortlessly, the now silent audience listened fervently, enraptured by the music. The second song of the night introduced his quartet companions: John Benitez on bass, Horacio Hernandez on drums, and Joaquin Nunez Hidalgo on percussion. As a group, there were in a word... seamless. Their musical blend produced a joyful, high energy, performance that couldn't help but get under your skin. In many of the audience, it caused involuntary head bopping, foot tapping, and larger than life grins...a temporary condition that lasted until the end of the concert. As the night progressed, we were treated to a fantastic fusion of various styles... ranging from classical music to very funky be-bop, all with an Afro-Cuban twist. Recognizable melodies would suddenly appear from nowhere, only to vanish back into the song... reprised later on when least expected. It was a marvelous display of technical musicality. More impressive yet, was how easily the group could transition from what appeared to be musical chaos, lockstep into a full melody, and back again. Even the chaotic be-bop segments, seemingly random notes and beats, were precise in nature. Any musician out there can appreciate the depth of difficulty involved in such a musical endeavour... let alone being able to pull it off perfectly while continuing to sound amazing. Of special note was the enchanting performance of Valdes's guest performer, Hugh Fraser, on the trombone. It was an unexpected treat to have another fantastic musician join the fray. His duet with Valdes was lilting and soulful, a lovely addition to the night. While the evening was light on lyrics, it was heavy on great music... and clocking in at two hours of near constant performance plus an encore, it was quite an experience. The Godfather of Jazz lived up to his hype and then some.